Stay straight on the main trail as a series of spurs head off to the left, including the junction with the Bruin Bluff Trail at Dipper Bridge at around 1/10 mile. By now the woods have opened up, revealing a sun-soaked meadow across the stream to the north, while tall grasses and willows line the creek. Approach the first of two junctions with the Creekside Loop Trail at about 2/10 mile. Take a left and follow this short detour for streamside views, or continue straight over a minor tributary before emerging at the second junction, where the two trails come back together, at 3/10 mile. 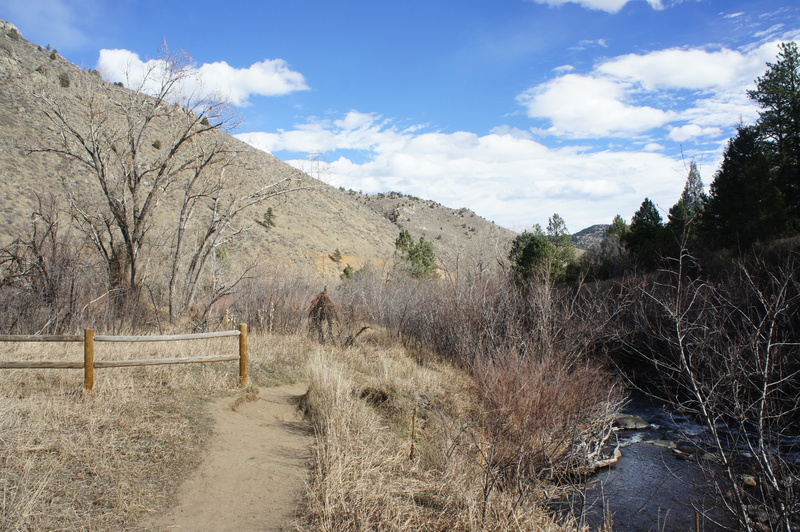 As the Bear Creek Trail continues southwest, it passes over a second, shaded tributary that is difficult, but possible, to pass in a wheelchair. As the trees dissipate again, the buzz of Highway 74, emanating from atop the slope to the right, is omnipresent and is by far the trail’s biggest flaw. 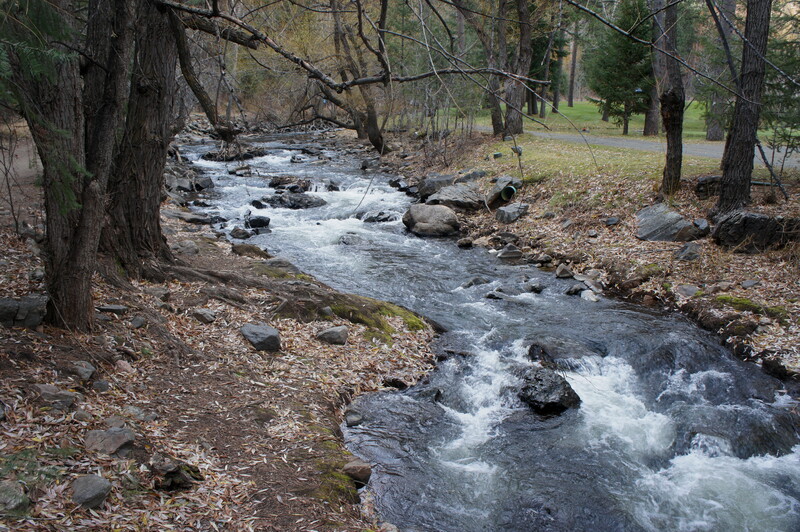 Just beyond, however, the sounds of vehicle traffic are mitigated by the charming flow of Bear Creek, which squeezes through a narrow notch at about the ½-mile mark. Spruce-strewn hillsides and high, blocky walls dominate the far side of the creek, making this a picturesque place to stop for a snack or to try your hand at fly-fishing, which is popular in the park. Now heading northeast, traverse the wide, steel bridge over Bear Creek at around 7/10 mile. 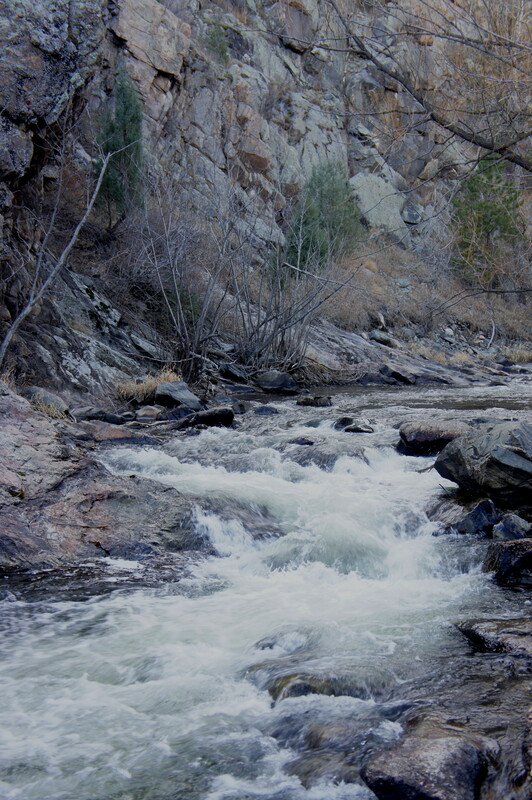 Soon after, the trail rounds a sharp left-hand bend and continues to follow the creek southeast. 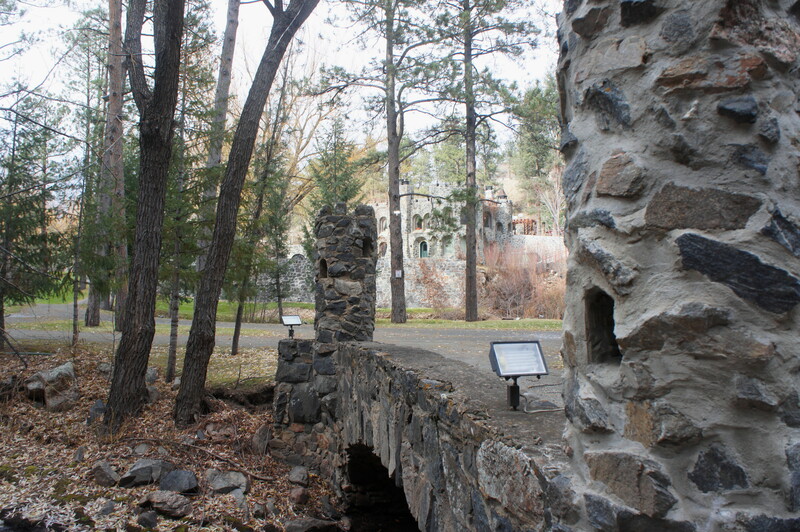 With high rock walls on the left, a peculiar sight comes into view, across the creek, at 9/10 mile: Dunafon Castle, built in 1941. Once an extravagant private home, this is now a popular wedding venue, complete with a Medieval-like appearance, a well-manicured lawn, a water wheel, and several man-made waterfalls. It is off-limits to passersby, however, as the “private property” signs facing the trail make abundantly clear. Beyond the castle, the increasingly rocky trail follows the creek, now flowing from the northwest, for another ¼ mile to the end of the hike. 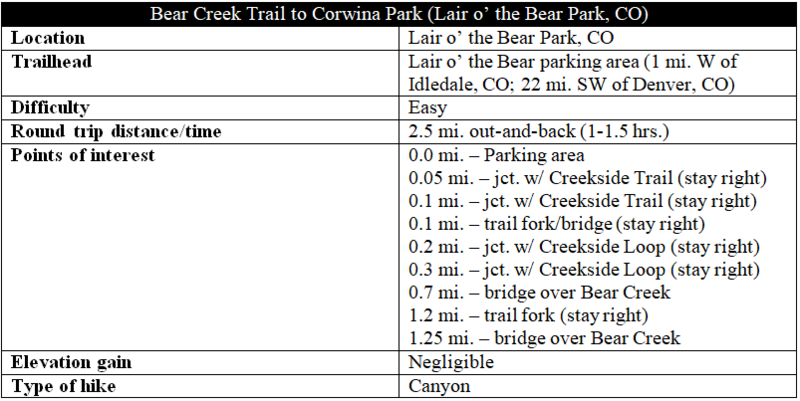 At 1.2 miles, the Bear Creek Trail abruptly cuts left, climbing a steep slope as it enters Corwina Park. The larger, smoother path continues straight to the western reaches of Lair o’ the Bear Park, which ends with little fanfare at a metal gate. 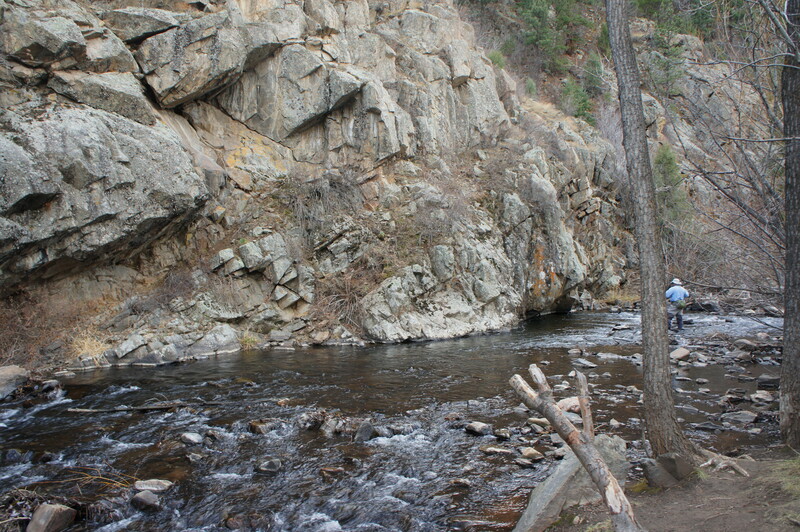 A wide bridge leads across Bear Creek, followed by a steep, gravel ascent to a very small parking area along Highway 74. Hikers with time and energy can continue up the steep Bear Creek Trail continuation to Panorama Point, which offers views of Mount Evans and the Front Range. (Note: Use caution while hiking, as the trail is chock-full of speedy mountain bikers.) All others should turn around, retracing your steps back to the start of the 1.25-mile walk. Try the 1.5-mile Bruin Bluff Trail Loop, which connects with the Bear Creek Trail, climbs to vistas of the valley, and weaves through conifer forests. 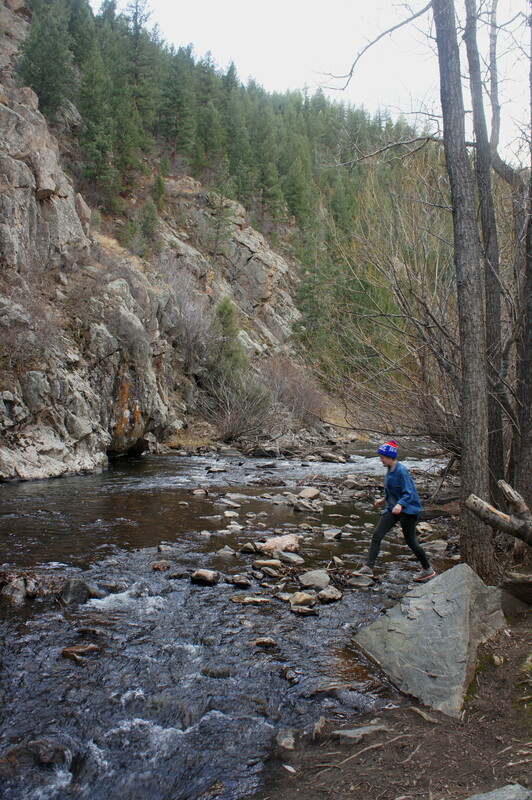 This entry was posted in Colorado, Easy Hikes, Jefferson County Parks and tagged Bear Creek, Bear Creek Canyon, Bear Creek Trail, canyon, Colorado, Corwina Park, Denver, Dunafon Castle, Idledale, Lair o' the Bear Park. Bookmark the permalink.